After being subscribed to a couple of beauty boxes, you end up with some products that you just don’t intend to use. Sure you would like to try each product, but if you are the type of person that likes to finish using something else up before moving onto another one (like me), then there is just no way you can test out everything that you receive. That is why I have decided to do a small giveaway on these deluxe sample products that would be more useful for another beauty out there. These products are all brand new and are decent sized samples so you could get a lot of use out of them and each one will get you beautified from head to toe. I know it’s not much, but who doesn’t want free beauty products?! Who’s ready to win? This giveaway is open to residents of the US & Canada. With the help of Random.org, the winner will be drawn on May 22, 2013. (This giveaway is in no way sponsored or endorsed. The winner will be contacted within 48 hours after the giveaway ends. If you have any additional questions – feel free to send an email to takeherword@gmail.com). Definitely most excited for the Stila prime pot! I like Vera Wang: Lovestruck Perfume – 4ml vial, because the smell is so nice. and she is so elegant at her age and her design is so wonderful. Love, Love Love. I am most excited to try the St. Tropez. I love all their other stuff, so this will be good to try! Loving the Clinique products!!! Especially the eyeshadow duo! My fave! 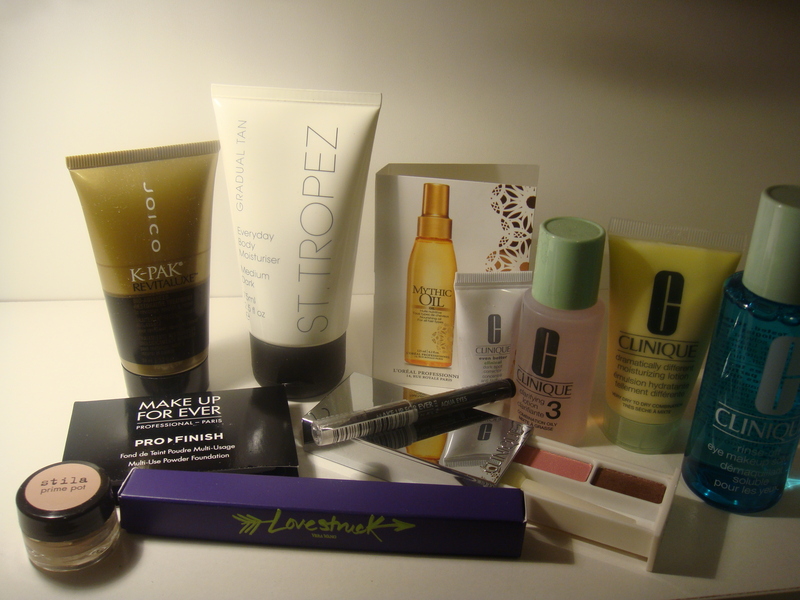 I would love to try St. Tropez, I have never tries any of their products. Hmmmm…either the Stila or the Joico would be amazing to try. I would definitely be most excited to try the prime pot!! Thanks for the chance! I am dying to try Joico: Revitaluxe Bio-Advanced Restorative Treatment for Hair, as my hair is really damaged oh and could REALLY use the dark spot corrector…who am I kidding I want them all!, shared on tiwtter https://twitter.com/BeautyFullLackr/status/335053825054482434 I am also following you on twitter @BeautyFullLackr and also following your blog via bloglovin as BeautyFull Lacquer! Oh I want to try the MUFE eyeliner :D and the Clinique dark spot corrector. Lovely giveaway. I’d be most excited about the Stila Prime Pot. I’ve been wanting to try that for a while now. I would loooove to try the Stila prime pot! :) thanks for the contest! The Make Up For Ever: Aqua Eyes Eyeliner Pencil in Black! Ooh, tough choice! I think I’m most excited to try MUFE’s Multi-Use Powder Foundation. Thanks for hosting this! I’d love to try Stila: Eyeshadow Prime Pot in Taffy!!! Thanks for the giveaway! I received the l’oreal mythic oil before but I really like how soft it makes my hair feel, I would love to get some more of that! Any of the clinique products, particularly the toner. I love it! I really want to try the Mythic Oil. Everyone has been raving about it! The product I would be the most excited to try has to be “Make Up For Ever: Multi-Use Powder Foundation in 118 Neutral Beige – 2g”… While I know MUFE by name and reputation, somehow, I never really tried it. I usually use Benefit products and sometimes they fail me on my oily skin, and people have been raving about their foundation, so, why not!! I’d love to have the smaller version of my lotion by Clique and I can never have enough eye products! I’d like to try the Joico Revitaluxe Bio-Advanced Restorative Treatment for Hair. Following your blog via email: kayla_93@hotmail.ca and Twitter: @93Gilbert. I am most excited to try: Stila: Eyeshadow Prime Pot in Taffy – 2g. Lovely giveaway. I’m a huge Clinique fan and I’d love to try the makeup remover. There are so many good products; It’s hard to choose, but I’m most excited to try the Vera Wang Lovestruck perfume! I’m most excited to try the Lovestruck perfume.